"No, it is you who has mean bones!" Animal Control said the dog's owner was the one with mean bones." Actors I needed to slap, in order of urgency: Idina Menzel, Anthony Rapp, and whoever played Angel. But whatever, I got what I deserved. At least the message of the movie came through: I now live each day as if it were the last one before I have to see that movie again! Well, clearly they're not kidding about not having all the nominations in yet, but this is neat. Those wanting to take a stand against panda-loving, camera-assaulting psychos could nominate me again if they felt like it. Wink! I forgot to blog until now. 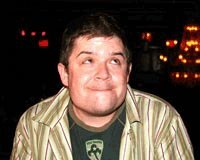 But look, it's a new interview with my favorite comedian, Patton Oswalt. Gosh, that manifesto thing sure did hit a nerve. My favorites were the people who thought I was trying to have the laws changed, the people who decided this was the time to debate the cause of Princess Diana's death, and, especially, the people who mistakenly and narcissistically thought I was writing about them. All those people were very funny. Thanks for the tons of nice emails, though! 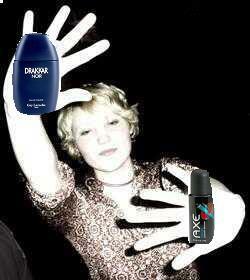 From now on, I will only attend parties with a bottle of either Drakkar Noir or Axe Body Spray in hand. A photographer has one chance to respect my wishes, and then he or she (though it's usually a he) will get sprayed. I have the day off today, so I won't be on the internet. Seeya Monday! Oh, and this is fantastic. Lame photographers, do your worst! I just got an IM from a friend saying that some of my blogger friends are offended by my manifesto. I'm sorry about that. I tried to be as abstract as possible because I don't really think people who do this are evil, I just think they need an etiquette lesson. Hopefully they'll channel their indignation into a vow to take photos only of the willing, because, after all, normal people should be able to leave their houses without being photographed. It's one of the few luxuries afforded to the non famous - please don't take our precious rights. Also, get over yourselves: I was writing about a rampant, out-of-control trend. I wasn't writing about you. I don't think anyone reading this doesn't already watch The Daily Show, but just in case: check out tonight's guest, John Hodgman, author of The Areas of My Expertise! "Wow, lots of cameras...put your cameras down and enjoy the show!" Guess how many people did? That's right: zero! 'Cause god forbid they just snap a few and then rock out like a normal person. Noooooo, they must get every angle in order to prove to their readers and friends that they were there, that they were at the cool show on the cool night with their cool camera. So cool. Cameras are ruining everything. Everything. I think I first realized this a few months ago, when I was getting ready to go to a party thrown by a media guy, but bailed at the last minute when I remembered that he hires photographers for his parties. Photographers who don't take "Please, no" for an answer. Photographers who won't allow you to have even a three minute conversation without sticking the flash in your face. At another party, I hastily took a sharpie to a cocktail napkin, writing "NO PHOTOS" and holding it in front of my face. Much has been written about the classic struggle/symbiotic relationship between celebrities and the paparazzi. Much has recently been written about those photo sites like Last Night's Party and The Cobrasnake and how they turn willing regular people into "celebrities". But what about normal people who just want to go to a party and talk to other normal people without a camera being shoved in their faces? Who will speak for us? The answer is: me. Concerts: If your burning, aching need for the validation that comes with proving you were at a concert gets the better of you, just take a few pictures at the beginning and then enjoy the show. Also, you might want to take a few moments of quiet reflection before doing so, to think about what rock and roll is all about, why you're there, and what the late Kurt Cobain might have thought of your flagrant disregard for the fact that someone is performing for you and others and all you can think about is website hits or something. Parties: Some people go out to see and be seen. Other people go out to interact conversationally with people they find interesting. Pray for god to grant you the wisdom to know the difference, because, and I know this is really hard to grasp so read it several times if you need to: There are actually people who exist who are not in love with their own image and have no desire to be on your blog/website/flickr page. They just want to talk to their friends. You can usually identify this rare breed of human by the withering look they give you as you focus your camera 4-5 inches from their nostrils. Leave these people alone and find the media whores - trust me, they are at every party and being photographed by you is probably the only reason they showed up. If a Photo is Taken: Ask the person before putting it on your website or Flickr. It's just polite, you know? It's common sense. And, finally: This post is dedicated to the douche with the giant Jewfro and brown blazer at last night's show who not only spent the first HALF HOUR taking pictures of the band and otherwise blocking people with his giant freakish head (and blocking the band with his camera), but ended the performance by taking MORE pictures on his cameraphone. 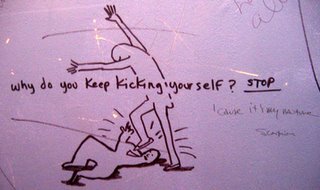 I just want to let you know that I fantasized about you last night: about knocking you down and beating you with your camera. It's definitely the first time the phrase "death rattle" has found its way into one of my fantasies! 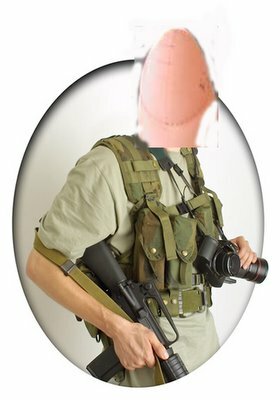 Anyway, I memorized the angle of your shots and Google searches blogs now and if it's the last thing I do I will hunt you down and find you and I will post a MEAN COMMENT on your blog without feeling any guilt or remorse whatsoever. * Demetri Martin was FINALLY on The Daily Show last night. (So I wasn't making that up last week, they just postponed it) His humor is more subtle than what's usually on the show. I hope they bring him back for more trend pieces. * Congrats to my friend Julia Langbein, authoress of The Bruni Digest, for the recent Associated Press attention! Julia will be performing with her improv group, Weiner Philharmonic, at tonight's Rejection Show. * This is funny: Matt Tobey messes with the head of another Nike salesman. And the winner of a (signed!) 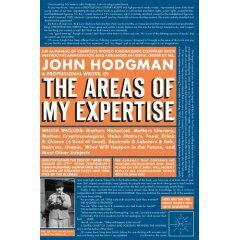 copy of The Areas of My Expertise by John Hodgman is... Evelyn Pollins of Chicago, Illinois. The answer was "The Garthim Master." Thanks to everyone who entered! Go here to learn more about The Areas of My Expertise and don't miss John Hodgman on The Daily Show next Wednesday night! Win The Areas of My Expertise! taken it upon themselves to draw them. Using only the internet, can you determine from the following sequence which is the missing "hobo name?" First correct answer in the subject line of an email wins a copy of The Areas of My Expertise. "Remember me from inside the restaurant?" Hey you know that show I won't shut the hell up about that premieres this Friday at 11 on Comedy Central, Comedians of Comedy? Well this preview clip/outtake went up literally 30 seconds ago: When Zach Met Maria ENJOY THE BRILLIANCE! Recognize the guest star? It's Jon Glaser. It is with GREAT PLEASURE that I have LEARNED that JOHN HODGMAN, author of the EXTOLLED, WELL-REVIEWED, and REALLY REALLY GREAT book, THE AREAS OF MY EXPERTISE, will appear as a guest on THE DAILY SHOW WITH JON STEWART on WEDNESDAY, NOVEMBER 16, 2005, one week from today. There will be a contest here related to The Areas of My Expertise tomorrow. * New band names based on grafitti. * hahaha, silly pictures of Jared Leto. * Wait, Abelard and Heloise "made it"? * Oooh, Oooh, I want a Sam Lipsyte button for my messenger bag! That sounds sarcastic but, like, seriously. Home Land is my favorite novel of the year so far, by far (yeah yeah I know it was published in the UK forever ago, nerd.) I wrote him a fan letter and he wrote back! * Don't forget to watch the premiere Comedians of Comedy this Friday night at 11. Huge congrats to my friend Andrew Hearst, aka Panopticist, who has a whole page of his fake magazine covers in this month's Vanity Fair! "please have your friends meet me by the playground at recess so that I can tell them they have big fat heads and they aren't my friend anymore"
* Sarah Silverman's Jesus Is Magic Sound Board. * The Apiary and Susie Felber report that there is a man impersonating David Cross in downtown bars in order to sleep with groupies. The jokes are all so obvious... I guess the upside is that when the real DC hangs out downtown now he can deflect unwanted fratboy attention by claiming to be the impersonator. For some reason, all my friends decided to have their events tonight. -- Will Leitch's Growth Spurt Reading Series continues tonight at Happy Ending with readers John Green (Looking for Alaska) and Judy Goldschmidt (The Secret Blog of Raisin Rodriguez). I mention John Green here a lot, probably because he's awesome. Trivia: his book, Looking for Alaska, will be a movie directed by Josh Schwartz, creator of The O.C. This is John's first time reading in New York, and The Growth Spurt Reading Series features a quiz bowl between the two readers at the end with real buzzers. Therefore, this is the thing I'm going to tonight. Doors open at 7 p.m., Reading starts at 8. "66% of Americans think President Bush is doing a poor job in Iraq. The other 33% think Adam and Eve rode dinosaurs to church." * Alex Blagg's 5 Dumbest Halloween Jackasses I Saw Tonight. * Today my employer, Comedy Central, launched MotherLoad, a broadband channel with clips from CC shows, cult classics, and web originals. * Last night me and my friend Stiff watched the movie "Tarnation." We have never before agreed about a movie, but we agreed on this one: worst. movie. ever. So nice of him to give his sick mom 4 minutes and 22 seconds of screen time in The Story of Jonathan's Love for Jonathan! Seriously, how did he manage to convince anyone that this movie was about his mother? So depressing. * I very much wish that it had been me who thought of doing this, but it was Daniel Radosh (shaking fist at sky): The New Yorker Anti-Caption Contest.